"The combined strengths of the groups involved provides a training environment for leading edge research towards future photonic systems that is hard to beat, worldwide." A plethora of new screen and projection display technologies have been developed, bringing higher resolution, lower power operation and enabling new ways of machine interaction. Advances in biophotonics have led to a large range of low cost products for personal healthcare. Advances in low cost communication technologies to rates now in excess of 10 Gb/s have caused transceiver unit price cost reductions from >$10,000 just a few years ago to <$100, and, in the last two years, large volume use of parallel photonics in computing has been realised commercially. 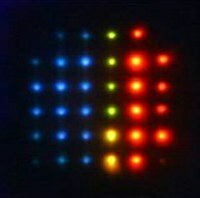 Advances in polymers have made possible the formation of not just links, but complete optical subsystems fully integrated within printed circuit boards, so that industrial users can expect to commoditise bespoke photonics technology themselves without having to resort to specialist photonics companies. Indeed in many cases, the performance of the photonic sub-systems greatly depends on electronic signal processing and effective systems integration. These advances have set the scene for a major change in commercialisation activity where photonics and electronics will converge in a wide range of information, sensing, and personal healthcare systems. Importantly, photonics will become a fundamental underpinning technology for a much greater range of companies outside the conventional photonics arena, who will in turn require those skilled in photonic systems to have a much greater degree of interdisciplinary training, and indeed be expert in certain fields outside photonics. As you can see from the table below, there is a huge breadth to photonics research at both Cambridge and UCL.